Walter G. Moss is a professor emeritus of history at Eastern Michigan University. For a list of his recent books and online publications, including some on wisdom, click here. His most recent book is An Age of Progress? Clashing Twentieth-Century Global Forces (Anthem Press, 2008). Now that Pope Francis has been named “Person of the Year” by Time magazine, it seems appropriate to examine his recent “apostolic exhortation,” Evangelii Gaudium, within a historical context. Although the Time essay on him states that his exhortation “goes directly after capitalism and globalization,’’ it offers little historical background for such a critique. The pope’s words, however, continue a distinguished series of Christian writings criticizing capitalism’s excesses. Preceding authors of such criticism include several popes and lay Christians such as the English Distributists Hilaire Belloc and G. K. Chesterton, pacifist/anarchist Dorothy Day, economist/environmentalist E. F. Schumacher, and Kentucky writer Wendell Berry. The pope criticizes the prevailing socioeconomic system as “unjust at its root” and bemoans its “baneful influence,” which threatens to “undermine any political and social system.” He faults capitalist “trickle-down theories” and a “globalization of indifference.” He believes they have discouraged any empathy for the poor. He laments the widening income gap between rich and poor, “the idolatry of money,” and “an impersonal economy lacking a truly human purpose” and concern for the environment. Against “ideologies which defend the absolute autonomy of the marketplace and financial speculation,” he defends ethical considerations and the rights of governments to regulate economies for the common good. Francis thinks that in our capitalist consumer culture “priority is given to the outward, the immediate, the visible, the quick, the superficial and the provisional.” He also criticizes capitalistic globalization for corroding the cultures of poorer countries and spreading ethically deficient values. Can we continue to stand by when food is thrown away while people are starving? This is a case of inequality. Today everything comes under the laws of competition and the survival of the fittest, where the powerful feed upon the powerless. As a consequence, masses of people find themselves excluded and marginalized: without work, without possibilities, without any means of escape. . . . Today’s economic mechanisms promote inordinate consumption, yet it is evident that unbridled consumerism combined with inequality proves doubly damaging to the social fabric. Inequality eventually engenders a violence which recourse to arms cannot and never will be able to resolve. . . . Inequality is the root of social ills. And Francis has more to say about the consumerism that capitalism promotes. 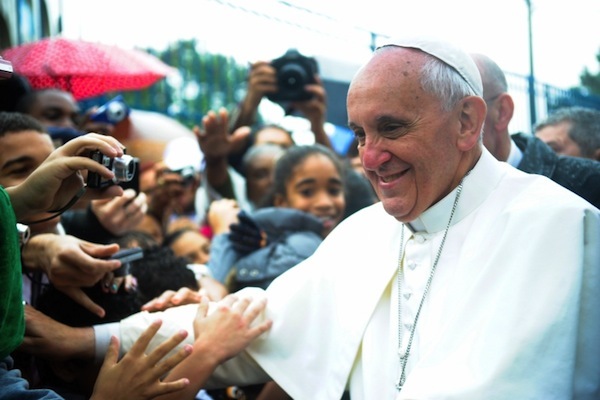 He criticizes our economy and “throw away” culture that treats people like “consumer goods to be used and then discarded.” They are treated as outcasts, as the “leftovers.” And without specifically using the term “structural violence,” (“physical and psychological harm that results from exploitive and unjust social, political and economic systems”), the pope alludes to it. He makes clear his belief that the responsibility for much of that violence stems from capitalist domestic and international policies. As a former Archbishop of Buenos Aires, Francis understands much about this type of violence, as well as the impact of capitalist international policies like those connected with so-called “neoliberalism” and globalization. But much of his criticism also has a long tradition stretching back in modern times to Pope Leo XIII’s Rerum Novarum (1891) -- exactly one hundred years later Pope John Paul II’s Centesimus Annus also contained some significant criticisms of capitalism. My essay, however, will not deal with the reproaches of these two other popes. Nor will it deal with any positive comments about capitalism either of them, or Pope Francis, have made. (See The Newshour referred to above for capitalist-affirmer David Brooks’ mixed review of Francis’s exhortation, as well as Mark Shields’ enthusiastic support of it.) Instead, we now turn to the important lay Christian precursors mentioned in this essay’s first paragraph: the Distributists (Belloc and Chesterton), Day, Schumacher, and Berry, the last three of whom I have treated in previous writings. With the exception of Berry, they were all practicing Catholics, with Chesterton, Day, and Schumacher being converts. Although Berry is a strong religious believer and relates that he sometimes goes to his local Baptist church and “takes the Gospel seriously,” he also admits that he has had “trouble conforming his thoughts to a denomination.” The two Distributists were both influenced by Leo XIII’s Rerum Novarum. Day, Schumacher, and Berry were all indebted to Distributist thinking, with the two Catholic thinkers also influenced by papal writings. Belloc and Chesterton, as well as other Distributists like the less prominent but more radical Father Vincent McNabb, were wary of large concentrations of power, whether economic or political, capitalist or socialist, and championed local communities, decentralization and the widespread distribution of property. In 1948 Dorothy Day, co-founder of the Catholic Worker movement, stated that “the principles of Distributism have been more or less implicit in much that we have written for a long time,” and that “the aim of Distributism is family ownership of land, workshops, stores, transport, trades, professions, and so on.” She declared the need for people to have “part ownership in workshops and stores and factories.” She insisted that machines and cities should be on a scale appropriate to humans, and she criticized assembly lines and mega cities for failing to meet that test. She defended her Distributist views and her criticisms of “ruthless industrialism” because she daily witnessed in her care for the poor those who suffered “the ugly reality of industrial capitalism and its fruits.” In subsequent years she often reiterated her Distributist beliefs. A more extensive critic of U. S. farm practices is Kentucky farmer and writer Wendell Berry, who greatly admires both Day and Schumacher. Indeed, he gave the first Annual E.F. Schumacher lecture in 1981. Like Day and Schumacher, he has been not only influenced by the Distributists, but is a strong critic of capitalist economics. For almost a half century Berry’s criticisms, whether in his fiction, non-fiction, or poetry, have been relentless. The two great aims of industrialism -- replacement of people by technology and concentration of wealth into the hands of a small plutocracy -- seem close to fulfillment. . . . Corporate industrialism itself has exposed the falsehood that it . . . ever has given precedence to the common good. No amount of fiddling with capitalism to regulate and humanize it . . . can for long disguise this failure. The evidences of it are everywhere: eroded, wasted, or degraded soils . . . whole landscapes defaced, gouged, flooded, or blown up; pollution of the whole atmosphere and of the water cycle . . . thoughtless squandering of fossil fuels and fossil waters, of mineable minerals and ores; natural health and beauty replaced by a heartless and sickening ugliness. Perhaps its greatest success is an astounding increase in the destructiveness, and therefore the profitability, of war. Pope Francis, the Distributists, Day, Schumacher, and Berry have each come to their criticisms of capitalism from somewhat different viewpoints. Day and Schumacher have usually been associated with the Left, but were critical of abortion. Berry has been championed, for different reasons, by both leftists like Bill Moyers and rightists -- see The Humane Vision of Wendell Berry, where all but one of 17 essays, including one dealing with Berry and the British Distributists, are by “social conservatives.” What unites Pope Francis and the other critics we have highlighted here, however, is their belief that many capitalistic practices are unwise and do not reflect our highest values.